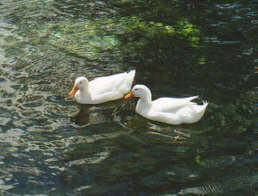 Melisani Cave is a nice cave, with a lake in it. A part of the roof collapsed some thousands of years ago, so most of the cave is in broad sunlight. 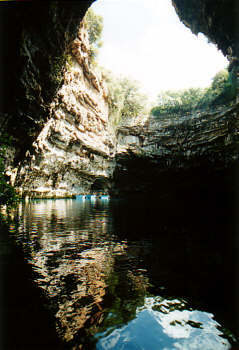 The cave is about 150 by 25 meters, the water is over 30 meters deep. 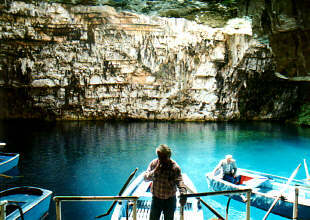 You can take a small boat trip through the cave, the boatman will tell something about the cave, point out fish and take your picture with your own camera. 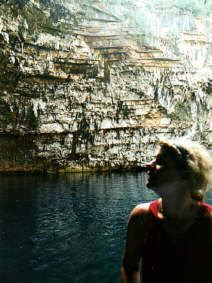 Although it is fun to visit a cave with an open roof, the extraordinary part of Melisani is that it is connected with the sea at the other side of the island, at a distance of about 28 kilometers, near Argostoli, and the sea flows from Lassi (near Argostoli) to Melisani, where it flows into the sea again!!! For those who wonder why this is so special: water always flows from high to low places. Since the sea is all around the island, the water level at both ends is exactly the same. So the water shouldn't flow. To explain this phenomenon, a lot of hydrologists broke their minds over it and came up with explanations involving the temperature of the water, mixing of seawater with fresh water and pressure, caused by rapid flow of the water. 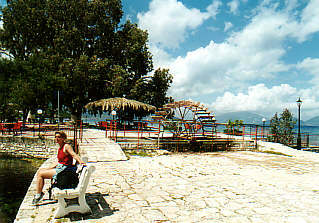 The stream from Melisani ends in Karavomilos in a lake, and then flows through a waterwheel into the sea. A similar waterwheel can be found at Lassi, where the water stream disappears into the ground.